While it may have turned its attention to the medical and industrial fields when first establishing the brand, VOOPOO quickly changed its focus towards the electronic cigarette industry when it acquired a vapor products brand. Having a great deal of experience, VOOPOO climbed to the top as a leading manufacturing brand, producing some of the most innovative products of our time. One of its latest and greatest releases is the VOOPOO Drag Mini Starter Kit and in today’s article, we’re going to completely break it down and share its ins-and-outs. Quality: The quality of the Drag Mini Mod is certainly impressive. It’s constructed of a superior zinc alloy material that’s both durable and lightweight. 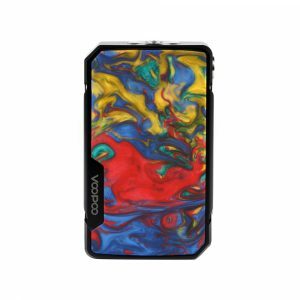 It uses all of the best materials and accents to present the best quality possible, from the resin inlay to the stainless steel buttons to the magnetized battery door cover, each part that consists of the Drag Mini Mod is top-notch. Appearance: When it comes to the appearance of the VOOPOO Drag Mini, it’s nothing short of amazing. It delivers outstanding appeal due to the striking resin inlay, which is available in Atrovirens, Rhodonite, Coral, Prussian Blue, Lava, Prussian, Purple, and Lime finishes. There are so many parts of this mod that will keep you visually pleased, such as the OLED display and both the sleek lines and curves throughout the body. Specifications: The Drag Mini Mod is designed, developed, and manufactured by VOOPOO, which has become a leading brand on the market due to the specs that go into each of its units. The device stands 81.5mm tall, 48.5mm wide, and only has a depth of 25.5mm. It has a centered 510 connection, a micro-USB port, and includes an integrated 4400mAh rechargeable battery. To further its capabilities, it also utilizes the highly advanced GENE.FIT chip. Features: There’s a multitude of features that make up the VOOPOO Drag Mini Starter Kit. For starters, its 117W power output is just the icebreaker to its full collection. The GENE.FIT chip has a full temperature control suite, TCR adjustments, a new FIT mode that’s designed to perfect battery, flavor or vapor production, and there is also a full protection suite. Quality: If there’s one thing you know about VOOPOO is that the quality doesn’t just stop with its devices. In fact, its fascinating quality is seen throughout its entire line, starting the mods, transferring to the tanks, and even its list of accessories. The VOOPOO UForce T2 Tank features extraordinary quality, which is one of the reasons why VOOPOO’s new UForce line has done so well. 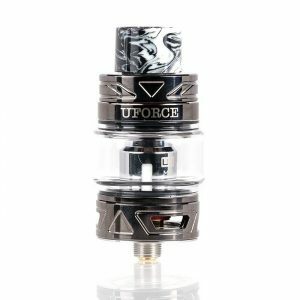 The UForce T2 Tank is constructed of 304 stainless steel and utilizes a pyrex glass material to enhance its durability and increase its longevity. Appearance: The appearance of the UForce T2 Tank is quite impressive, delivering a chassis that boasts its stainless steel structure. Aside from its many features adding to its appeal, the inclusion of a 14mm resin wide bore drip tip with vibrant colorways really sets this tank apart. Specifications: The tank stands with a 25mm diameter and 28mm at its widest point. It offers a 5ML e-liquid capacity and uses two coils that come included with the kit, including the 0.6-ohm P2 Single Mesh Coil and the 0.13-ohm N1 Single Mesh Coil, which supports up to 100W. Features: On top of using the UForce OCC Coil Technology, the VOOPOO UForce T2 Tank’s most vital feature is the quick vent channel design for rapid heat discharge and the short chimney, which makes this tank flavor-focused. Add in the top fill system, the 14mm resin wide bore drip tip, and the triple auxiliary bottom airflow control and you’ve got yourself a dominating tank.